Stefan Agrigoroaei received his doctorate in 2007 at University of Savoie, Chambéry, France, under the mentorship of Professor Olivier Desrichard. His research program is in the area of health and adult development and aging, from a lifespan perspective. Stefan is primarily interested in the contribution of modifiable psychosocial and behavioral factors to different facets of health - physical, cognitive, and psychological. His projects involve a wide range of cognitive and physical health assessments, including biomedical indicators, in both surveys and laboratory settings. The results have direct implications for developing intervention and prevention programs for applied settings. 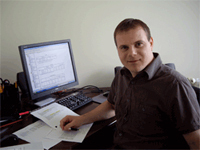 Stefan is currently an Assistant Professor at Université catholique de Louvain in Belgium. Agrigoroaei, S., Robinson, S. A., Hughes, M. L., Rickenbach, E. H., & Lachman, M. E. (in press). Cognition at midlife: Antecedents and consequences. In C. D. Ryff & R. F. Krueger (Eds. ), Oxford handbook of integrated health science. Oxford University Press. Lachman, M.E., & Agrigoroaei, S. (2012). Low Perceived Control as a Risk Factor for Episodic Memory: The Mediational Role of Anxiety and Task Interference. Memory & Cognition, 40, 287-296, doi: 10.3758/s13421-011-0140-x. Agrigoroaei, S., & Lachman, M.E. (2011). Cognitive Functioning in Midlife and Old Age: Combined Effects of Psychosocial and Behavioral Factors. The Journals of Gerontology, Series B: Psychological Sciences and Social Sciences, 66B(S1), i130–i140, doi: 10.1093/geronb/gbr017. Lachman, M.E., Neupert, S.D., & Agrigoroaei, S. (2011).The Relevance of Control Beliefs for Health and Aging. In K. W. Schaie & S. L. Willis (Eds. ), Handbook of the psychology of aging (7th edition). Agrigoroaei, S., & Lachman, M. E. (2010). Personal Control and Aging: How Beliefs and Expectations Matter. In J. C. Cavanaugh & C. K. Cavanaugh (Eds. ), Aging in America: Psychological aspects (Vol. 1, pp. 177-201). Santa Barbara, CA: Praeger Perspectives. Lachman, M.E., Agrigoroaei, S., Murphy, C., & Tun, P. (2010). Frequent Cognitive Activity Compensates for Education Differences in Episodic Memory. The American Journal of Geriatric Psychiatry, 18, 4-10, doi: 10.1097/JGP.0b013e3181ab8b62. Elizabeth Hahn is a postdoctoral research fellow who completed a doctoral degree in the interdisciplinary Aging Studies program in the summer of 2012 in the School of Aging Studies at the University of South Florida (USF). While at USF, she completed a doctoral dissertation titled, “Daily Experiences of Stress, Memory, and Emotion in Older Adults with Mild Cognitive Impairment” under the advisement of clinical psychologist William E. Haley, PhD. 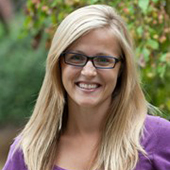 She also worked on various longitudinal research projects examining risk factors for cognitive decline and dementia with Swedish population-based data under the advisement of dissertation committee member Ross Andel, PhD. Elizabeth approaches her research with an applied, interdisciplinary and lifespan perspective. Her general areas of research focus on examining aging processes as they occur in everyday life, specifically relationships between stress, memory, and emotion. Her doctoral dissertation used a daily diary study design to assess daily stressors and daily memory complaints in relation to psychological distress among older adults with Mild Cognitive Impairment and a comparison group of cognitively health controls. Her current and future work includes both the examination of short-term fluctuations and long-term intraindividual change, as well as the study of protective factors (e.g., control beliefs) and adaptive strategies (e.g., elective optimization with compensation) that may buffer normal age-related change, early stages of pathological cognitive decline, and their potentially negative effects in everyday life.